I have a small strip of land that gets 6 hours of sun a day. It's the perfect spot to try growing potatoes. Vertically. In a box. I got the idea from this article in the Seattle Times. The hook is that you can grow a lot of potatoes in a tiny space; just what I need. Greg Lutovsky, who has been growing potatoes as a business since 1993, says you can grow 100 pounds of potatoes in 4 square feet. All it takes is some lumber, seed potatoes and careful attention to watering. The story was enough to get me started, but it's a little short on practical advice. For that I turned to Sinfonian, who meticulously documented his potato-in-a-box efforts last year. 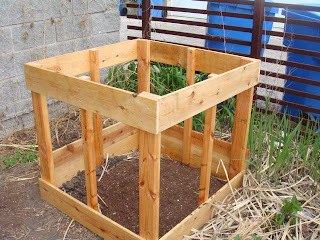 The idea is to pile up soil around the growing potato vine, adding more soil--and boards to the side of the box--as the vines get taller. Potatoes will grow between the seed piece and the above ground plant. When the plants start flowering, after about 100 days, you can remove a board or two from the bottom and fish out a couple of potatoes. Or you can wait until frost kills the plant in the fall and harvest them all at once. There are plenty of sites that explain how to store potatoes. With a bit of luck, I'll be doing that this fall. If you want to grow vertically, there are several alternatives to choose from: grow bags, wire cages, stacked tires, large containers. All had drawbacks, so I chose to make my 3'x3' bin out of cedar fencing boards and southern yellow pine. I gave all the pieces a coat of linseed oil, hoping that this will protect the wood from rotting. I bought, and then chitted, 3 pounds of Inca Gold seed potatoes from Ronniger Potato Farm. Inca Gold are late season potatoes, an important detail for this type of growing. According to Sinfonian, early season varieties only set fruit once, making them bad candidates for potato towers. You'll end up with a few at the bottom of the box and that's it. I just planted my seed potatoes today. As they grow, I'll add more cedar boards to the sides of my box and cover them with dirt. I'm following the same method of piling up soil around a growing vine--but with sunchokes-- in SIPs on my roof. I think you could do the same with potatoes. We'll be over later this summer with something to trade for a few of those spuds, Bruce. Nice box! Hmm. Seems like you could also do this with some kind of bag, and if you sewed in sleeves/tubes periodically, that you could tie off, and then untie when you wanted to reach in and root around for a spud, you wouldn't have to worry about soil falling out when you pry off the boards. I am using exactly that a potato bag or a smart pot to grow mine. It is essentially the same idea. I found mine online and purchased them. However it is exactly the same idea. Pile up a little dirt when the stems reach about 9-10 inches tall and continue to do so till you get to the top. BTW all three of your rooftop gardens look great. Thanks for the compliment Chris. I'm fascinated by all the little 'tricks' that I'm learning about growing food. Potatoes in a box, or bag, is the latest one. You're right about the soil spilling out. My thought was by the time I open the bin in the fall, all the plants surrounding the box will have died away, and so it won't matter that they're covered in dirt. I started some in empty feed sacks this spring. I didn't know about the need to use late season potato varieties, though...I'm pretty sure I used a mid-season potato. We'll see how it goes/grows! Trial and error, isn't it. If I remember/have enough energy, I'll do a post in the fall on my results. I'm curious to hear what other methods yield, hope you leave a comment there. Well, I don't really know. This is the first year for me. I'm using 1 year old potting mix that my neighbor was throwing out. (Thanks Charlie!) To that I'll add maybe a gallon of earthworm castings that I got from Nance Klehm and some Espoma 5-3-3 tone. The link to Sinfonian mentions he uses--I think--a souped up potting mix plus some 15-15-15 fertilizer. Hi Bruce, I had communicated with you last year through Flickr regarding my small rooftop garden near UIC. I grew about 10 buckets of potatoes last year, half on my roof and half on my back patio area. I suspect they don't yeild as well as if they had more root space, but I got 4 or 5 decent potatoes per bucket and a bunch of small ones (which I just rinsed off and through into soups or stew). I started them kind of late around this time last year. I had filled the bucket about half full, and added dirt as the leaves and branches grew, analogous to an article I had read from a fellow growing them in old tires. I'm trying potatoes this year for the same reason - they seem more substantial/nutritionally dense than everything else I'm growing. I can't plant acres of wheat or miles of beans. Potatoes are manageable. I am doing this using the smart pots. However, I am wondering if these are going to be tall enough. Anyone have any innovative ideas on how to add on height to these? Knock wood, my spuds have had a recent growth surge. For whatever my research might be worth to Summerbean: I planted one planter of mid-season reds and one planter of late season fingerlings. 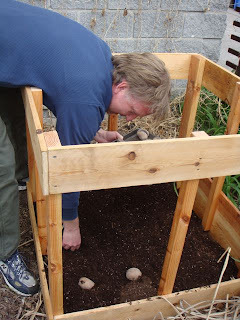 I read on one or two of the many potato box blogs that this planting method will work with mid season potatoes as well-- I too had unwittingly purchased some mid-season potatoes and was concerned. how is this potato box growing? can we see some updated pictures. I'd like to do this next year. If you speak french, check out this site. Plenty of good pictures, including a series showing potatoes grown in a straw pile held together with branches. Babel Fish does a pretty decent job of translating. Here's the site Bruce shared translated into English - http://bit.ly/8Iko5. Thanks for the link Bruce!